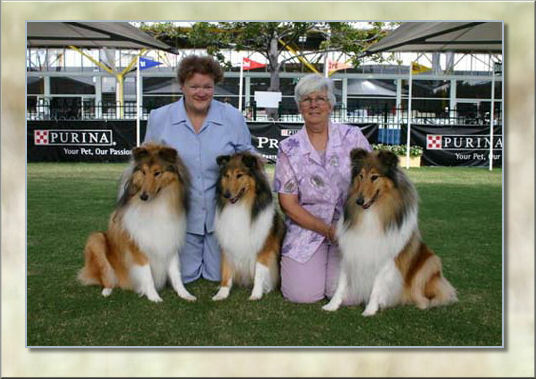 I credit my love of Collies firstly to my mother and also to the “Lassie” movies and the series. My mother bought her first Collie in 1948, Rover only lived a few years but Mum like all Collie people couldn’t live without a Collie and in 1955 she bought Bon Lomond Lisa. Lisa was by the Champion sire Edendale Enoch, Mum showed Lisa quite extensively and I still retain the ribbons and certificates she won. Lisa left this life in 1968 after becoming ill with Cancer. I was 12 years old when Lisa departed and in 1969 my parents bought me my first Collie, Lentoray Lucky Boy. Lucky was by the Champion sire Glendallo Gamblin Man and bred by Mr & Mrs Amos. 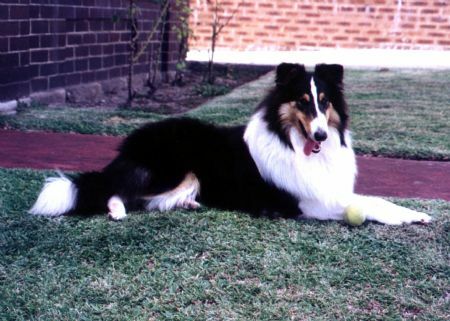 Glendallo is one of the most well known and well respected kennel prefixes in Australian Collie history owned by Mrs Glad Osborne. Lucky did not have a long life with us and the tragedy of his loss was too much to bear and for twenty years I did not have a dog. During the intervening years i started riding lessons with Diana Gould at Willow Park, School of Classical Riding, where i learnt to ride correctly in the true classical dressage style. I competed at Dressage and in the Hack ring but i also enjoyed learning showjumping, cross country and best of all trail or road riding. In 1997 my mother became ill with Dementia and was placed in a nursing home, I was on my own and craved a four legged companion. I looked up some books and found Kathy Drew. Kathy told me about a tri-coloured, 4 month old pup. I went to see him and fell in love. Patch was my constant companion, my foot warmer and my best friend. Patch & I went to obedience training and his intelligence and ability was amazing. Patch always has a smile on his face and over the years he was always at my side when trouble arose. Sadly Patch quietly passed away on 20 December 2007, leaving a void that will never be filled. My many friends and Kathy encouraged me to show Patch, our first show we went home with a boot load of sashes and trophies. I had finally found what I had waited all my life to do. I was hooked. Kathy taught me how to wash, groom, trim and present Patch at shows. As the years have flown by I have bought and bred Collies and I now have seven collies in my yard. I have the famous names of Cathgarry (Mrs Kathy Drew), Cathkin (Mrs Gaye Jones) and Sunnyhurst (UK) (Mrs Pauline Hayden) in my bloodlines. Gaye has become my mentor and a very dear friend and i have a very deep respect for her knowledge of the Collie. In 2000, my second litter from Cathgarry Truly Charming (Adele) by Cathkin Ferraris Touch produced my first champion Rixown My New Charm (Casey). In March 2004 Casey gave birth to her first litter by Ch. Cathkin Kith n Kin (Kim), amongst them was a beautiful golden sable male, when he popped out, I knew this was the one for me. His name is Rixown Atoucho Sunyhurst (Toby) so named as a tribute to the memory of Pauline Hayden who passed away in February 2004. Toby has now gone to live in Victoria as a companion. My life revolves around my menagerie of animals, as well as the seven collies, I also have two cats and two horses that i rescued from being destroyed. My aim in life is to breed happy, healthy, good natured, true to breed type, quality Collies acceptable for breed, obedience and pet. All animals bred from are eye-tested and hip scored. I therefore, warmly invite you to view my website, study the bloodlines and look at photos of some truly beautiful Collies.